Are you one of the 25% of Americans' that have low credit scores? Are you one of the 25% of Americans that have low credit scores? In July 2010, FICO Inc. reported that 25.5 percent of consumers have a credit score of 599 or below. As you know low credit scores can prohibit you from getting a credit card, auto or mortgage loan, or more importantly, a job. Banks and lenders are using stricter lending criteria which has made it almost impossible for many consumers to obtain credit. FICO’s findings were based on consumer credit reports as of April 2010. Over the past 2 years there was an increase in approximately 2.4 million people in the low credit score category. The first missed payment on an account can take up to 100 points off a credit score. Ironically, if you already have bad credit the impact on your credit score is less severe and the missed payment may only cost you up to 30 points. A foreclosure will drop your credit score 150 points. Extreme drops such as these can take a while to rebuild credit scores. Unfortunately if the economy remains flat and little to no growth occurs, it is likely more consumers will experience lower credit scores. There was a significant shift in the important number of consumers with credit scores between 650 and 699. The new data reveals this group represented 11.9 percent of credit scores. See your credit score now! This is a slight decrease from 12 percent in 2008 and reflects a drop of roughly 5.3 million people from its historical average of 15 percent according to FICO. The significance of this group is that consumers with lower credit scores are not likely to seek new credit such as a mortgage or auto loan. However, consumers in the 650-699 may attempt to seek new credit but find it more difficult to obtain while running head first into the lenders’ stricter standards. It is not that these consumers may be flat out denied, but they may find it harder to get good interest rates. The one good consequence of stricter credit criteria is that more and more consumers are getting out of debt and staying that way. Many consumers who got in over their heads with credit cards have learned the value of using cash. Although banks have begun to offer credit cards to consumers with less than perfect credit again. 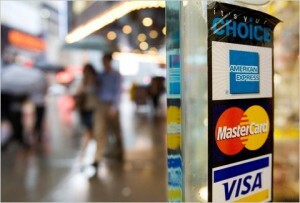 According to the New York Times, credit card offers to consumers are surging. They found several banks mailed out about “ten times as many credit card offers this year compared to last year” and one credit card company increased their mailings by “fiftyfold.” Approximately 17% of those offers were mailed to consumers with less than perfect credit. This is up from the 7% mailed in 2009, according to the New York Times. The lull of easier credit may be the reason there has been in rise in spending. Kathy Grannis of the National Retail Federation (NRF) said “consumers are slowly getting back into discretionary gift giving which is very important in terms of monitoring the state of consumer sentiment.” NRF predicts there will be a 3.3% growth in retail sector for November and December from last year. If you are one of the consumers with lower credit scores, consider rebuilding your credit. The Open Skysm Secured Visa® Credit Card is a good choice for consumers looking to rebuild or establish their credit. There is no credit check and no checking account required. You determine your own credit limit with an FDIC-Insured deposit ranging from $200 to $3,000.